Installing pathway lights are not only good for security but also for beautifying the environment. 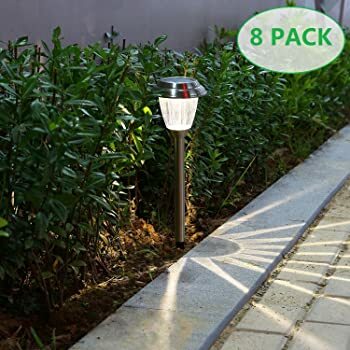 To get the perfect balance of beauty and functionality, then you should look at the installation of solar path lights. 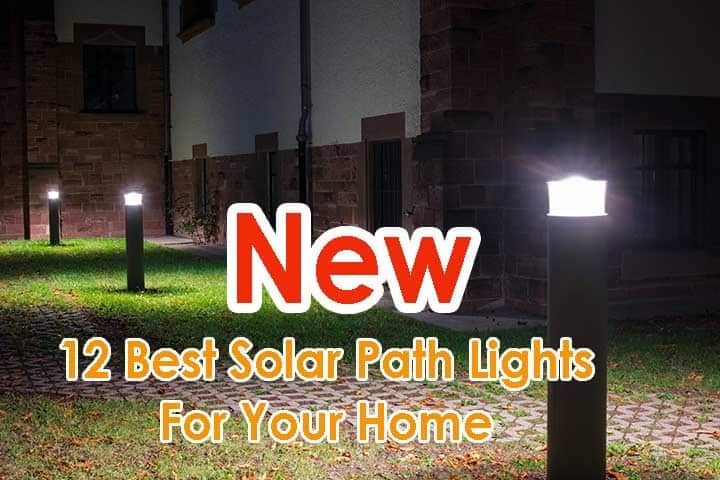 Whilst there are vast options to choose from, our sole aim in this article is to write about the best solar path lights available for sale. We would also be writing about what can make you understand solar path lights better. 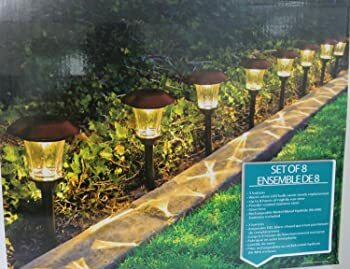 Pathway solar lights might have similar features but some features are very crucial to the performance of any solar path light. To help you get the best solar path light, we will be giving you some important features you must always look out for below. Solar lights normally work with batteries and they are naturally not as bright as electric lights. But solar lights have different outputs which are measured in lumens. Choosing lumen ratings according to your needs is very important. When you want super bright light, then it is advisable to go for solar lights with higher lumen rating. Also, if you want dim solar path lights, you should go for lights with lower lumen ratings. Although you should note that the higher the lumen rating, the faster the batteries get drained. Sometimes it is advisable to sacrifice brightness for a long-lasting battery. One important feature you must take note of is the material used to make the pathway light. The best solar path lights are always weatherproof which means they can withstand any weather condition. Since you will be installing the lights outside, they might have to face harsh weather conditions. It is best to go for pathway lights made with stainless steel which ensures they are free from rust. Besides, when choosing lenses, you have a choice between plastic and glass lenses. The glass lenses provide a better glow of light but they are susceptible to cracks. The plastic lenses on the hand are stronger but they do not glow as much. Why choose pathway solar lights that the only function it has is glowing when you can add beauty to it. 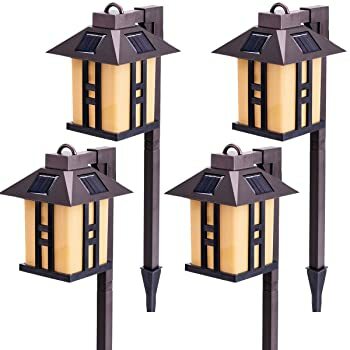 The best solar path lights are not meant to glow alone but to also add aesthetic value to your surroundings. Due to a lot of designs and shapes to choose from, there is a guarantee that you will get one that suits your taste. 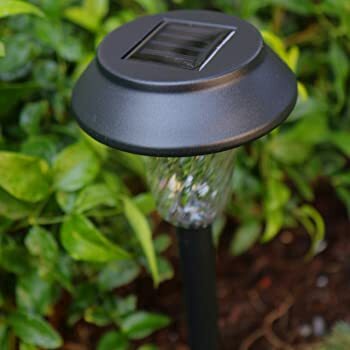 Read more: What To Consider when buying best solar post lights? 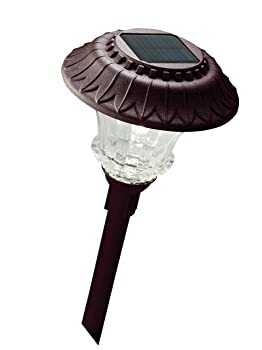 When looking for solar path lights, there are varieties of products to choose from. This is why we have taken the pain to help you choose some of the best solar path lights you could find and reviewed them. We ensured we did not review only quality solar path lights but beautiful ones too. Read on and discover the best solar path lights from the plethora to choose from. The CINOTON Solar Path Torch is a perfect combination of beauty and functionality. The manufacturers designed it to look like a torch with a real flame which gives your surrounding a distinctive style. With 98 LED bulbs per light, that is a guaranty that you will have a very bright light. The light also features a flickering effect which makes the flames look like they are actually dancing. Furthermore, the light has an auto on and off feature. This feature allows the solar light to turn on automatically when it senses darkness and it turns off when the sun starts to rise. Installation of the CINOTON Solar Path Torch is very easy. This is because all you need to do is fix the spike of the stake into the light holder. 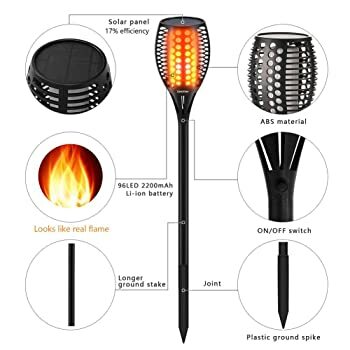 Another way to install this solar light is by sticking the spike into the ground. When well charged, the lights can last up to 10 hours. Although, you must note that they charge differently in varying weather conditions. To get the best of these lights, ensure that you charge them for a minimum of 2 days before you start using them. Besides, the lights are weatherproof which guarantees that they are usable in any weather condition. To prove the all-around quality of this product, the manufacturers have slapped a two-year warranty on it. Finally, you also get two-month money back guarantee in case you don't like what you purchased. Looking for a solar path light that actually works? 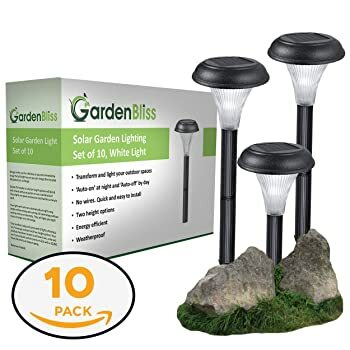 Then you should check out Gardenbliss’ 10 pack outdoor solar light. The lights have 4 lumens each which are dim for some people. But the lamps have an opaque plastic lens that creates ambient light for its surroundings. The reality is; if you are looking at solar lights that can serve as beautifiers, you should not be considering this Gardenbliss’ product. This is because they are more industrial looking than beautiful. The manufacturers made these solar lights to stand the test of time. 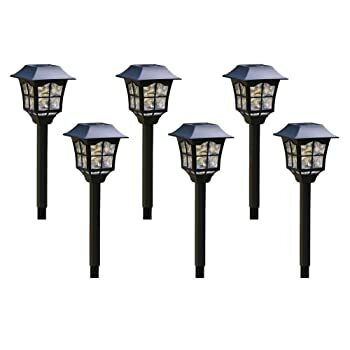 They are very durable and this is because the lamps have weatherproof stainless steel casing. With the weatherproof feature, you can rest assured that they will function well even in the snow or in very hot conditions. Speaking of durability, each bulb has a 30,000-hour life which is particularly impressive. Also, after a single full charge, each lamp can last for up to eight hours. Furthermore, the lights have automatic on and off feature. They turn on when it is going dark and automatically turn off when it is becoming bright. Finally, the installation of this product is easy and all you need to do is dig the earth and place the stakes in it. Moreover, since the stakes are plastic, you should not try to dig the earth with it because you might break them. Moonrays solar light company is one of the biggest companies in the industry. 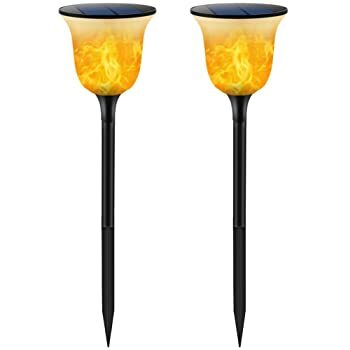 They provide different types of solar lights needed by users. Their products are famous for durability, quality and beauty. 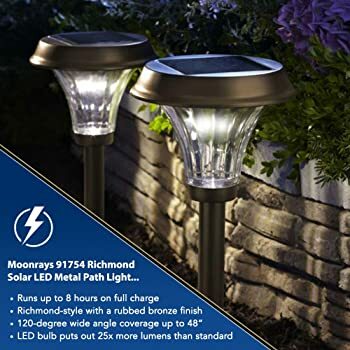 The Moonrays 91754 Richmond Solar LED metal Path light has bright warm lights. Its 30-lumen output is brighter than normal path lights which means that a single one can light up a path well. Also, it has a ribbed glass lens that gives the light a 360- degree display. 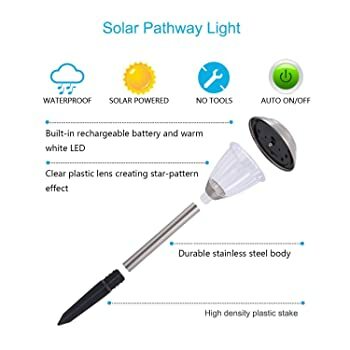 Furthermore, the solar path light is energy saving. This is because after charging of the light by day, it turns on itself automatically at sunset and off at sunrise. This makes energy conservation easier as you do not have to turn it off and on yourself. Additionally, with this product, you will be saving yourself future energy cost. This is because they are durable and you will only have to make replacements after a minimum of 3 years. Installation of solar lights can’t be easier than that of the Moonlight 91754. This is because to install requires no expertise and all you need is to unbox the product, dig a hole and place it there. However, you should ensure that the hole should not be dug with the stake to ensure that they don’t get broken. A beautiful style is also synonymous with Moonlight and this is why The Moonlight 91754 is made to be aesthetically pleasing. It has a beautifully ribbed bronze finish and a big glass lens to give it the desired bright light. Finally, the frame of the solar light is made out of metal which makes it sturdy. Voona Pathway Solar Light is one pathway solar light that's made elegantly. The manufacturers made it with stainless steel and beautiful plastic lens. The lens lets the light to leave a beautiful star pattern on the floor when turned on. When turned on at night, you are sure to have a beautiful light view, especially when lit up around flowers. 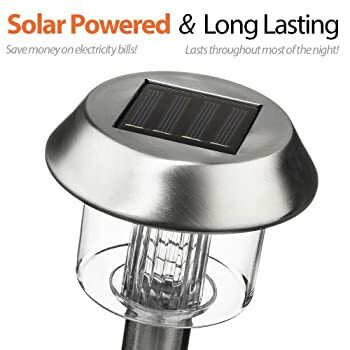 Stainless steel is waterproof which means that you can install the solar light anywhere with the assurance that it can withstand the constant heavy downpour. The material also ensures that it withstands snow and even high temperature. Furthermore, these solar lights are very efficient. This is because, when they charge during the day, they turn on automatically when it detects darkness. And they turn off immediately at sunrise by themselves. This allows for easy usage, and problem free operation. Also, the LED light has an output of 6 lumens which ensures that the LED light consumes less power. After a full charge, the battery can last up to 8 hours which some might consider as being small. Installation of the Voona Pathway Solar Light is very easy because it is wireless. And all you need to do is dig the earth and place the stake in it. Besides, if you do not like the product, you can return it after at most 30 days to get a full refund. This gives customers the assurance of quality product and product satisfaction. 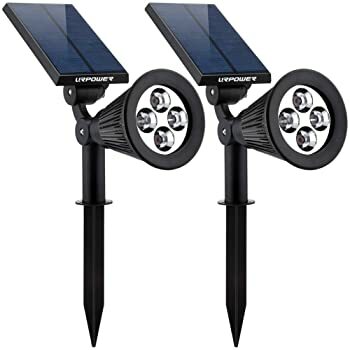 The URPOWER Adjustable Solar Spotlight is one of the adaptable solar lights around. One of the reasons is because you can choose to mount them or have them staked depending on your preference. Also, you can adjust the solar panels and this is particularly useful for sunlight maximization. Another reason it is versatile is that it has an auto light on and off feature and a button to switch it off. This button helps to preserve the battery of the solar light. You can also dim the bright light by using a button on the solar light. Still talking about versatility, you can use the light both as spotlights and as path lights. When using the brightest setting of the light, you should note that the highest level it can light up is about 14 feet. Although, the brightest setting means the light won’t be on all through the night. One major concern about the URPOWER Adjustable solar light is its poor battery but you can replace the battery at any time. It tends to fade after some time. 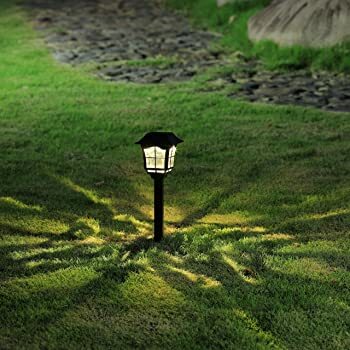 Enchanted Spaces Solar Path Light is one of the most beautiful solar lights you could find. The lights come in a 6 pack and the manufacturers styled them in such a way that makes them aesthetically pleasing. It also has a soft glow that makes it the right light for gardens and the sidewalk. Besides, the bronze colour of these lights makes them more exotic. Another feature that makes the design pleasing is because it is waterproof which ensures that you can install them outdoors without worrying about rust. Furthermore, this solar path light has individual on/off buttons that allows you to control when they are turned on or off. This helps preserve the batteries and it means you will only have them on when you need them. Besides, they are very strong and this is why the company offered a replacement warranty on each of the solar lights. This means that for every part broken, the company will have it replaced for you. Installation is also easy and this is because of the absence of wires. All you have to do is dig the earth and place them there. Finally, each of the stakes is 16 inches long and for a better installation, ensure that you bury at least 4 inches. The product has a warranty replacement. GIGALUMI is a household name when it comes to beautiful quality solar lights. Their Solar Path light is no different and mere looking at it; potential users will fall in love with its design. It is shaped like a large window looking lampshade and its powder coat finish further improves its looks. It is an ideal option for beautifying your gardens, pathways and patios. Another feature it has is that it is weatherproof which makes it suitable for any weather condition. The producers also guarantee quality by placing a 180-day warranty on it. This means you can get a replacement of the lights if they get damaged within this period. Furthermore, installation is very easy because all you need to do is turn on its switch and push the stake into the ground. Finally, the solar lights have an automatic light sensor which makes it turn on when it is dark and off when it is dawn. Installation of the solar light is easy. The warranty period should be longer. 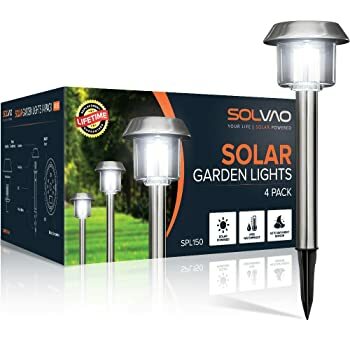 As you might have noticed that one of the most peculiar features of the solar lights we have been reviewing is the beauty. Hosus Solar Pathway Light is not different as the producers have put in efforts into making their solar lights as beautiful as possible. However, with 6 lumens of light, the solar light isn’t as bright as we would have wanted them to be. The lights take just 8 hours to charge fully and after the charge, you can enjoy the lights all through the night. Durability is one feature that stands out from this product and its weather-resistant feature better reflects this. Regardless of how heavy the rain or snow is, or how hot the weather is, the Hosus Solar pathway light can withstand it. To further assure the quality of the product, Hosus has offered a lifetime replacement guarantee which we are not sure you can get anywhere else. Finally, to install the solar light is not a heinous task and this is due to the fact that it is wireless. All you need to do is to push it into the ground to set it up. Plow and Hearth Solar Lights are made in such a way that they can withstand any weather condition. They are also made to be sturdy which ensures they stand the test of time. This is possible because of its die-cast aluminium. 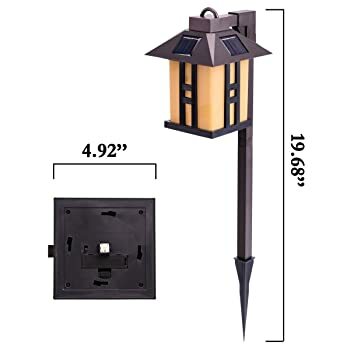 Beauty is another endearing feature of the Plow and Hearth pathway solar light. The craft on the product is very detailed which makes it a good beautifier of your yard or gardens. Also, each head of the path light has 6 very bright white LED lights which illuminate the night well. Furthermore, you get up to 10 hours of light after fully charging the battery of the solar light which gives you a guarantee of having more light through the night. Installation of this particular product is also easy and this is because it is wireless. You do not have to seek the help of an electrician because all you need to do is to bury the stakes in the ground. 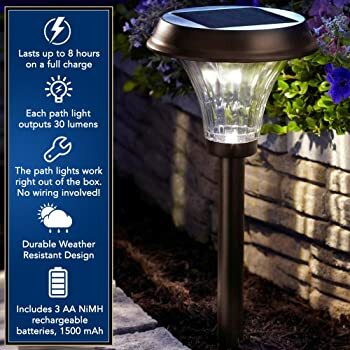 The Plow and Hearth pathway solar light also has an auto on and off feature that when charged, turns on automatically when it is getting dark. It also turns off itself when the sun starts to rise. 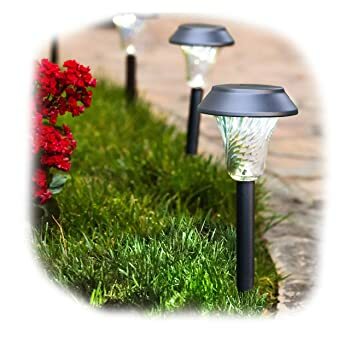 HGTV Solar LED Pathway lights are very beautiful solar lights. 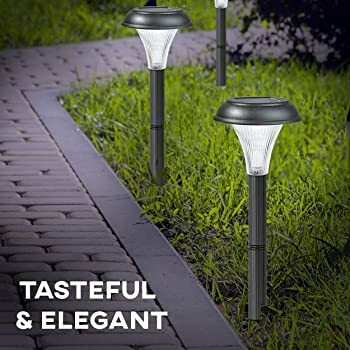 The manufacturers ensured that these lights are the ideal solar lights for path beautification. The black frames are coated with powder and finished with black oil. This gives it an aesthetically pleasing look. With 3 lumens per lamp, the lights are dim making it the right choice for marking the paths. Furthermore, the solar panel of each light is crystalline which ensures that it converts sunlight to energy easily. The batteries of the HGTV Solar LED Pathway lights are rechargeable and each one of them can last up to 8 hours when fully charged. Made from stainless steel, the lights are waterproof which makes them durable. The lenses are also made of glass and this makes the solar light to shine warm white lights. Furthermore, each of the lights measures 18 inches which makes them shine off the grass. Installation is also made easy because the solar lights are wireless and all you have to do is place the stake in the earth. Finally, it has an auto on and off feature which helps to end the stress of doing it yourself. Another product from the SOLVAO Company, the SOLVAO upgraded solar spotlight is an improvement on its predecessor. It has a total output of 200 lumens which is as powerful as solar lights in its price range can get. With that much light, you can rest assured that your yard and pathway will be lit up. Also, the solar light is adjustable to suit your preference. This allows you to be able to arrange and turn lights as you deem fit. Furthermore, it has an automatic sensor which allows the light to turn itself on when it is getting dark and off at dawn. Also, the SOLVAO upgraded solar light is IP45 waterproof. It also has a stainless metal build which makes it usable no matter how cold or hot the weather is. Finally, installation is quite easy because of the absence of visible wires. All you need to do to install is to unbox the product and stick the stakes into the earth. Looking for solar torches with dancing flame design? 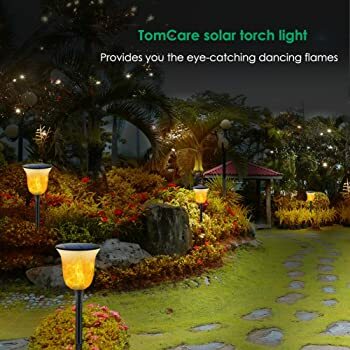 Then the TomCare Flickering Solar light is one you should take a look at. It is weatherproof and can withstand the hottest weather and the coldest snowfall. 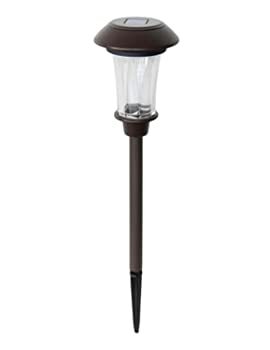 This makes it the ideal solar light for outdoor purposes like for paths, patios, gardens or backyards. 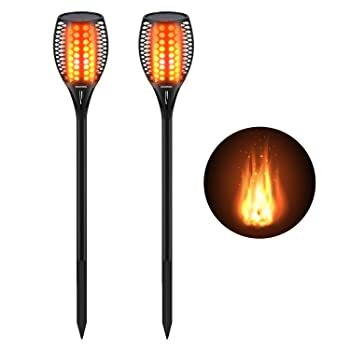 Also, the TomCare Flickering solar light has very bright beautiful lights that looks like real flames. The aesthetic design of the light, lens and frame of this solar light also makes it a good option for home beautification. The batteries that run these beautiful lights are high-capacity 2200 mAh lithium rechargeable battery. When fully charged, the batteries can last up to 10 hours in sunny weathers and 6 hours when it is snowy. Charging of the battery usually takes 8 hours which is fast when you compare it with most of the solar lights in its range. With its automatic light sensors, the lights will turn on immediately it is getting dark and off when it detects light. This helps to reduce human operation and stress. Finally, installation is quite easy because all you need to do is stick the stakes in the ground to get them running. As at the time of review, we couldn’t find any con. There are different components that make up a pathway solar light. The components include a battery, a LED light, a light sensor and a controller board. During the day, the solar path light stores energy which it will use to power the LED light at night. This happens when the solar cells absorb light which in turn charge the batteries. The light sensor is not present in every pathway solar light but it works by turning on light automatically when it detects darkness. It also turns off the lights automatically when it detects light. To get the best out of your solar path light, you must maintain them well. In the next paragraphs, we will be giving you tips that can help you maintain them. Trees and shrubs can be in the way of the rays of sun needed by the solar light to charge. This is why you must make it a duty to frequently trim the trees or bushes that surround the pathway solar light. By doing this, you will be getting the best out of your solar path lights because they will get charged faster. When the bulbs are dusty, they do not shine as bright as they are supposed to. This is why you should clean the bulbs routinely depending on how dusty the environment can get. Occasional cleaning of the fixtures will not only make them look more beautiful but also ensure that they last longer. When you want to clean the fixtures, ensure that you do it gently to avoid breaking something during the process. The reason why your solar panels are not charging as you expect them to might be because of dust accumulated on them. When solar panels are dusty, the sun will not be able to penetrate easily. This, in turn, will reduce the performance of the solar lights. To clean your solar panels, use soapy water with a soft rag. You can also use brushes in case the debris is not coming off. Also, it is advisable to clean the solar panels early in the morning because the solar panels are not hot by this time. There are different types of batteries that solar lights use. The two most common types are nickel cadmium (NiCD) and nickel metal hydride (NiMH). Both of them vary because the NiCD batteries are known to last for about two years. They must be disposed of correctly because they can cause hazards to the environment when not disposed of the right way. 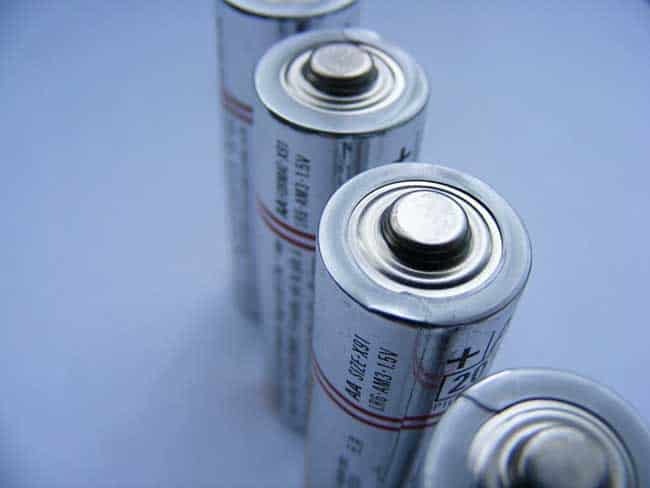 The NiMH batteries, on the other hand, can last longer and can be disposed of any way without fear of environmental hazards. From this, you can conclude that the NiMH batteries are better options. How long will solar path lights run? Solar path lights run time varies with their battery power. Some might run for 5 hours and others can run up to 10 hours. Why is there an off/on switch on my solar path lights? Solar path lights often have the off/on switch if they do not have auto light sensors. This means that you have to put on the light or put off the light manually. Can I use my solar path lights in the winter? Yes you can if they are weatherproof. Also, if you are worrying if they will get charged in the winter, they will. You should, however, note that they won't charge as much as when it is sunny. 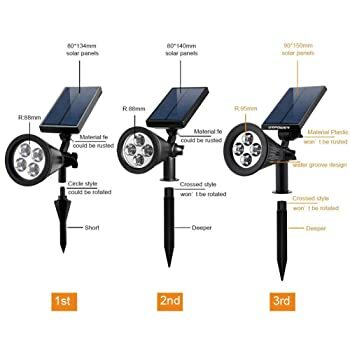 After reviewing the best solar path lights we could find, we have concluded that the Cinoton Solar Light Path Torch trumps the rest on the list. This isn’t because the other solar path lights aren’t good enough but this is because the Cinoton Solar Path Torch stands out. Its endearing features include innovative design like the dancing flame and its strong battery life. This product combines beauty and performance effortlessly. In this article, we also wrote about how to choose a solar path light and how to maintain them. We also answered some FAQs which we are sure will prove useful to you. Overall, we have been able to write extensively about the best solar path lights. We hope you have found the right solar path light for you out of the many ones we reviewed. The CINOTON Solar Path Torch is a perfect combination of beauty and functionality. With 98 LED bulbs per light, that is a guaranty that you will have a very bright light. The light also features a flickering effect which makes the flames look like they are actually dancing. Furthermore, the light has an auto on and off feature. This feature allows the solar light to turn on automatically when it senses darkness and it turns off when the sun starts to rise.